Image Credit: Jim Watson, AFP, Getty Images. Only 26 percent of women who obtain STEM (science, technology, engineering, math) degrees work in STEM jobs. New legislation coming out of the Oval Office earlier this week seeks to tackle this issue by creating new opportunities for these women, as well as girls who are interested pursuing STEM and entrepreneurial careers. 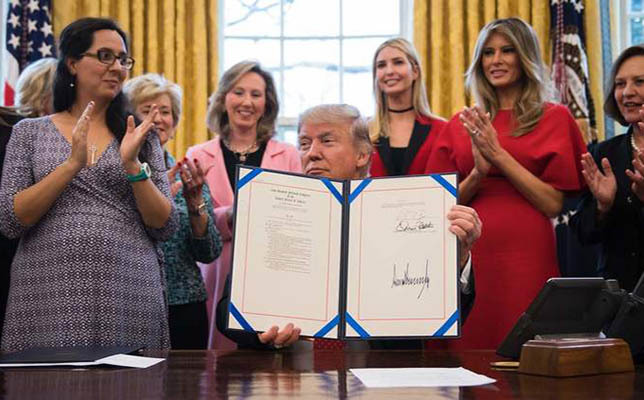 President Donald Trump signed two bills Tuesday — both introduced by women in Congress — aimed at recruiting more women for STEM fields. Summer Institute in Science, Technology, Engineering and Research (SISTER), a program at NASA’s Goddard Space Flight Center that allows female middle school students to explore careers with women engineers at the center. The INSPIRE Act’s objective is to report on existing activities with current and retired NASA personnel. It aims to identify how NASA could best support these astronauts, scientists, engineers and innovators to participate in outreach efforts. NASA has 90 days to present plans to engage with girls to the House’s Committee on Science, Space, and Technology and the Senate’s Committee on Commerce, Science, and Transportation. The second measure, Promoting Women in Entrepreneurship Act, authorizes the National Science Foundation (NSF) to support entrepreneurial programs for women. It was introduced by Congresswoman Elizabeth Esty (D-CN.) and gives NSF authority to expand programs that “recruit and support women to extend their focus beyond the laboratory and into the commercial world,” according to the bill.